For the first time in 21 years, the Pittsburgh’s Fifty Finest campaign hosted a live band, In The Mood. With a new venue, and a record number of over 1000 people in attendance. Three Rivers Entertainment, and In The Mood joined in the festivities as Pittsburgh honored one of their very own, Natalie Shugars. Natalie was among the top earners for the Pittsburgh’s 50 Finest class of 2016. Natalie hosted events all summer to raise awareness, and funds on behalf of the Western PA Chapter of the Cystic Fibrosis Foundation totaling $10,000.00. 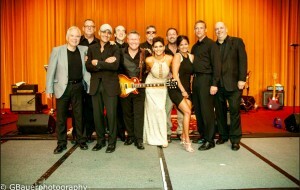 Natalie joined her band onstage at the Wyndham Hotel in Downtown Pittsburgh as fundraising came to an end, celebrating began, and the party rocked the evening.